« Data Privacy Day: Call the Information Specialists! 2017 was a big year for libraries and the UN. On the ground, librarians from 75 countries committed to raise awareness of the Sustainable Development Goals, and get involved in national plans to deliver them. 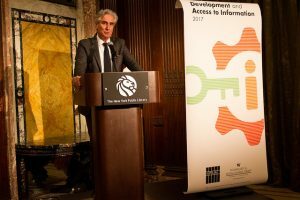 At the international level, IFLA launched the first Development and Access to Information report, a partnership with the Technology and Social Change Group at the University of Washington. So what’s happening in 2018? This blog offers a look at what’s happening at the regional and global levels between now and the end of the year. Keep an eye on the Library Development Programme webpages to hear more about upcoming International Advocacy Programme! The highlight will be the High Level Political Forum in July, where national governments come together to discuss progress towards the Sustainable Development Goals. Just as last year, a few SDGs have been chosen for special attention. This allows more in-depth discussion of these specific goals, without forgetting interlinkages with other parts of the 2030 Agenda. Importantly for IFLA, SDG11 is one of these. 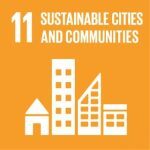 Under the title Sustainable Cities and Communities, it’s the Sustainable Development Goal that covers all libraries do to build more cohesive societies, and to safeguard cultural heritage. It’s a great opportunity to highlight how libraries stand at the hearts of the villages, towns and cities they serve. You can get an idea of this contribution from this report published by the European Parliament late last year. IFLA will be there, underlining that at essential actors in preservation and community-building, libraries must be at the heart of relevant decision-making processes. However, the High Level Political Forum is far from everything. Much of the work – and indeed a richer opportunity to contribute – comes in the series of regional meetings held between March and May. These are organised by the UN’s regional economic and social commissions and look at the delivery of the SDGs – and in particular those in focus that year – from a more local perspective. IFLA will also aim to be active at all of these – especially given how important SDG 11 is for our institutions. It is also an opportunity to meet with UN experts and government representatives from the region, and put libraries on their agenda. It’s important to remember that the 2030 Agenda is about more than just the Sustainable Development Goals themselves. It’s also about monitoring and measuring progress towards them. A key tool for this is voluntary national reviews, where Member States submit a report and present what they are doing to achieve the SDGs. At the High Level Political Forum, they also take questions from other governments and civil society. Clearly these are voluntary, and state-led, meaning that they are not necessarily a tough interrogation. However, they are a great opportunity to share good practice. And through the preparation process – which should involve consultation with civil society (such as library associations), they are an opportunity to make the voice of libraries heard and their contribution known. IFLA will be encouraging libraries in relevant countries to get involved in the voluntary national review process this year. You can find out more by reading the guidelines produced by the UN for volunteering countries this year. A key issue in 2018 will be preparation for 2019. This is special because it is the year that the Sustainable Development Goals as a whole will be reviewed. Targets may change. And following this, indicators also as part of a parallel process due to conclude in 2020. Having put so much into ensuring that access to information is included in the SDGs, we will need to ensure it stays, alongside other targets that reflect the work of libraries. 2019 will also be the year that three crucial SDGs for libraries will be in focus – access to information (as part of SDG16), education (SDG4) and employment (SDG8). IFLA will be focusing its efforts to make sure we make the most of this chance to let everyone know how essential and innovative our institutions are. 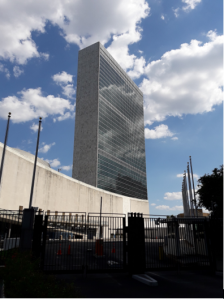 Following the arrival of its new Secretary-General, António Gutteres in 2017, the United Nations has been looking at its own structures and processes. A review of its development work has been central to this, with many UN agencies operating their own programmes independently. To ensure a great impact, the Secretary-General is looking to promote stronger coordination at the national level. The process is not yet over, but a priority seems to be to give a greater role to UN coordinators at the regional and national level. This should help ensure that initiatives taking place are coherent. As already recommended to International Advocacy Programme Participants, making contact with these representatives of the UN will be a great way to put libraries on the agenda for development policies. You can find a report of the latest discussions here. 2018 is looking busy – we hope you’ll be able to join us, through your actions, your ideas, your examples, and your presence! Don’t hesitate to contact us if you have any questions! We usually get to know through journal and our national media that several institution have been working on project to align it with SDG goal as per their international commitment. In the Library context, it is very difficult to find space where as half the digital literate are using webopedia and search engine to enhance their information literacy .Sometime they are served biased,opinionated and agenda oriented and fake information . In this digital world ,Library find very unique position for authenticity and evaluated as custodian of knowledge. In my opinion, Library can play very important role in underdeveloped society to build their competency to spur knowledge society ecosystem. During my literature review and desk research, I found that IFLA has carried out extensively work how to align library services to achieve SDG Goals by 2030. IFLA is very focused organization to make sure we make the most of this chance to let everyone know how essential and innovative our institutions are and can play very important role – access to information (as part of SDG16), education (SDG4) and employment (SDG8). 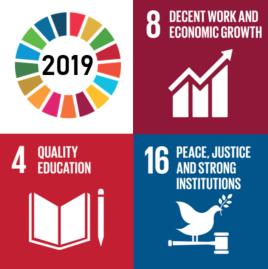 SDG goals will be revised and changed in 2019 is very crucial for libraries – access to information (as part of SDG16), education (SDG4) and employment (SDG8). In 2016 ,IFLA launched a capacity-building programme with objectives to raise the level of awareness on the SDGs of library workers at community, national and regional levels, and to promote the important role libraries can play in development by contributing to the UN 2030 Agenda and the SDGs; and Increase the participation of library associations and public library representatives in advocacy work at national and regional levels to secure sustainable public access to information through library services and programmes.